Here is a 16' x 16" acxrylic painting of our ornage cat, Duc, fishing fo rgold fish in our pond. I have not seen him be successful yet but he is very watchful. In New Orleans there are currently paintings hanging at two of my favorite New Orleans restaurants. One is the music club with great food, Buffa's. It is open 24/7 and is located at 1001 Esplanade Ave. (504) 949-0038. Hera is a post on the opening: My Paintings Are Up at Buffa's Backroom. The other is Riccobono's Panola Street Cafe. Here is a post describing the showing. It is located at 7801 Panola Street (504 314-1810). You can also contact me to see more of them. Here is a 16" x 20" acrylic painting of Duke, who is an important part of my new home in New Orleans. This is the first painting I have done in 8 months since I was in Samos, Greece. There has been too much going on with my moive an dother things but I am now settled in my new home. There will be a painting of a pot of gmbo in my next post on Thursday. i am going to explore New Orleans and Louisiana themes in my painting for a while. Here is an 18" x 24" acrylic of our orange tiger cat, Rex. He has avery regal personality to go with his name. I put in a blue background to make the dogs stand out more in this 18" x 24" acrylic painting. Here is how it was before with off white background. 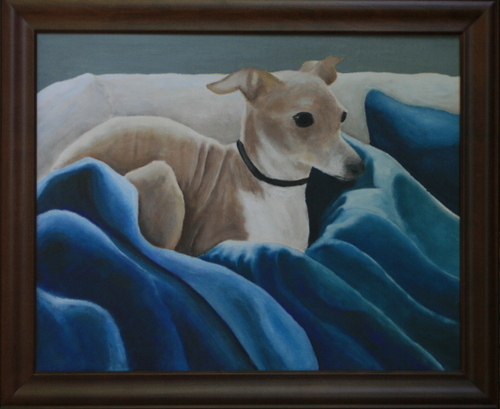 Here a painting of my dog. Bela. He is an Italian Greyhound, weighing in at 11 pounds. We refer him as an Armani dog. It is a 18" x 24" acrylic.